Phyllis Deane retired emeritus professor at the University of Cambridge and an authority on economic history, particularly the British Industrial Revolution, and the history of economic ideas, has passed away. Data collection on the British National Accounts led to her volume, with Max Cole, British Economic Growth, 1688-1959, which remains a classic on the Industrial Revolution, and later to her broader volume on the topic depicted above. 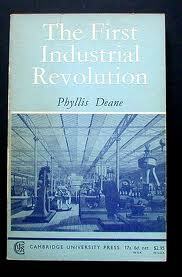 She also wrote a very readable volume on the history of economic ideas, The Evolution of Economic Ideas.